The video ended with a trailer for another execution in which a young, dark skinned boy warned Britain of coming atrocities. It raised fears that the child, who appeared to be around five, may have been made to execute someone on camera. 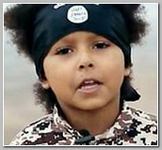 The child was identified by his grandfather Henry Dare as four-year-old Isa Dare, son of east London Muslim convert Grace ‘Khadija’ Dare who also used social media to brag of her desire to be the first female Briton to kill ISIS hostages from the West. Grace ‘Khadija’ Dare, 24, has in the past also posted pictures of Isa carrying an AK-47. She was brought up in a Christian Nigerian family in Lewisham before becoming radicalised in a Mosque, allegedly the same one as the two men who went on to behead army drummer Lee Rigby in London in 2013. She made her way to Syria in 2012 and married Swedish jihadist Abu Bakr, who is believed to have since been killed. She may also know Abu Rumaysah who has also been linked directly as a mentor to one of the Rigby killers. Some 600 Britons have been stopped from going to Syria to try to join Islamic State and other militant groups, Foreign Secretary Philip Hammond said in comments reported Saturday 01/16/2016. Meanwhile some 800 British Western Jihadists have made it through since 2012, with half of them still thought to be inside the war-torn country, he said, in comments reported in The Guardian and The Daily Telegraph newspapers.